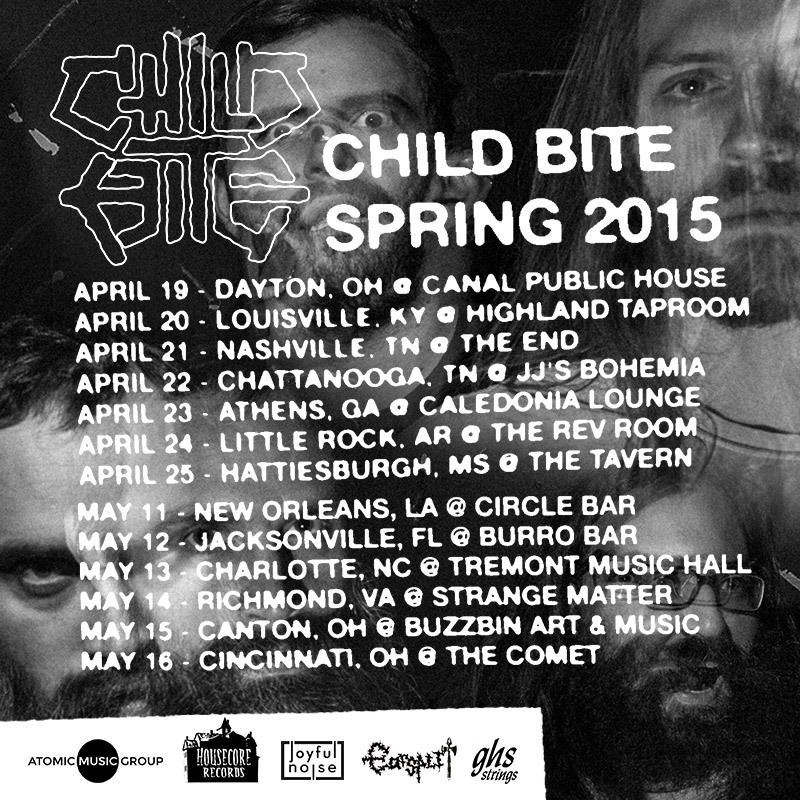 Published by Sareth Ney on April 1, 2015 at 4:22 p.m.
JACKSONVILLE, Fla.—Child Bite will be performing at Burro Bar, on May 12. The tour begins on April 19 at Canal Public House in Daytona, Ohio and concludes at The Comet in Cincinnati, on May 16. Shawn Knight is the vocalist, guitarist and sampler, Sean Clancy is the bassist, Brandon Sczomak is the guitarist and Jeff Kraus is the drummer of Child Bite. Later in 2015, Child Bite will appear on Celtic Frost’ tribute record and it will be released on Corpse Flower Records. There will be a 155-page comic edited by Mark Rudolph. They’ll also be covering “The Usurper” with Philip H. Anselmo on vocals. While en route on their tour, they plan on taking about three weeks off and visit Anselmo’s Nodferatu’s Lair in New Orleans and track a follow up with 2014’s “Strange Waste” EP. After departing, they plan on resuming the tour. "The soundtrack to the greatest psychotic slasher film that never was... a mangled mash-up of noise rock and punk that comes across as something deranged yet catchy." "The riffs on the record are catchier than the clap, and the rhythm section is a constant pummeling." "Child Bite's music smashes into you, as fast as a freight train and just as heavy. The guitars are a blistering blur of nimble and gnarly tones, with the rhythm section's raucous grooves propelling a raspy, yowling vocalist's emphatically motor-mouthed lyrics..."
"Knight's voice is what I image one would get by throwing the vocals of Mike Patton, Jello Biafra, Joe McTighe, David Yow and Dave Brockie into a furnace to mix together and pour out as a flowing molten blend. Strange Waste is one of those rare albums that is ridiculously good from start to finish." "Child Bite makes the type of noise that could appeal to fans of just about everything... you like your music loud and slightly unhinged then this will be right up your street." To visit Child Bite’s official website, please click here. To visit their bandcamp page, please click here. To “Like” them on facebook, please click here. To visit The House Records website, please click here. April 20 - Highland Taproom, Louisville, Ky.
April 21- The End, Nashville, Tenn.
April 22 - JJ's Bohemia, Chattanooga, Tenn.
April 23 - Caledonia Lounge, Athens, Ga.
April 24 - The Rev Room, Little Rock, Ark. April 25 - The Tavern, Hattiesburgh, Miss. May 11 - Circle Bar, New Orleans, La. May 12 - Burro Bar, Jacksonville, Fla.
May 13 - Tremont Music Hall, Charlotte, N.C.